Wisconsin Pheasant hunts are available. The game farm is located 5 miles west of Berlin on County Rd. F. The pheasant farm consists of prime hunting grounds which includes fence rows, cattails, sorghum, sunflowers, trees, and wild grasses. Schroeder's operates as a no membership club that is open to the public. No membership is required. No hunting license is needed. To aid your hunt, dog handlers are available with advance notice. A recreation room is provided for your use, you are encouraged to bring refreshments and food. Season is open and will be closed for the first 3 days of opening gun deer season. We can accommodate corporate or custom hunts. We will work the hunt to your needs. All Hunts are done by appointment. Morning or afternoon hunts may be scheduled. Each group will have at least 40 to 100 acres to hunt upon. Each person is required to have some blaze orange for everyone's safety. It is recommended that high brass 4,5,6 Lead or 2,3,4 Steel be used for clean kills. 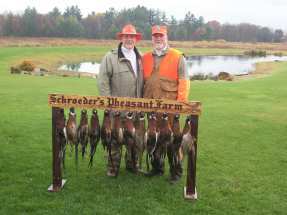 Our goal is to give our customers a quality hunting experience that replicates a true Wisconsin pheasant hunt. We will aim to tailor your hunting experience to meet your groups needs. Send mail to geneschro@gmail.com with questions or comments about this web site.